amazing vegan tiramisu at nite moon in los angeles! today is my husband’s birthday, and every year i try to track down a vegan version of his all time favorite dessert: tiramisu. 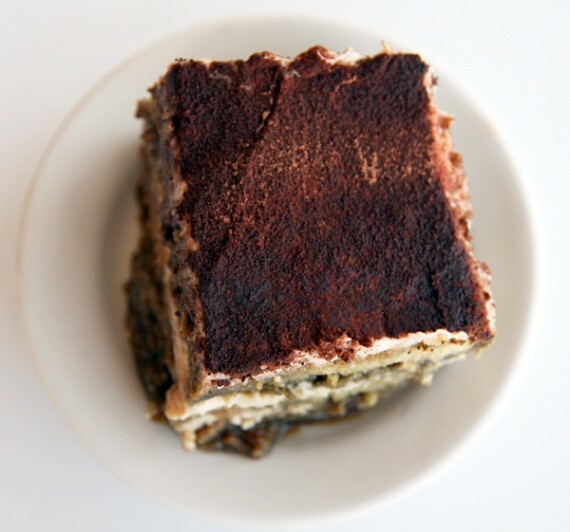 vegan tiramisu is very difficult to come by, especially in los angeles, and on thursday i started to panic because i didn’t have a plan. 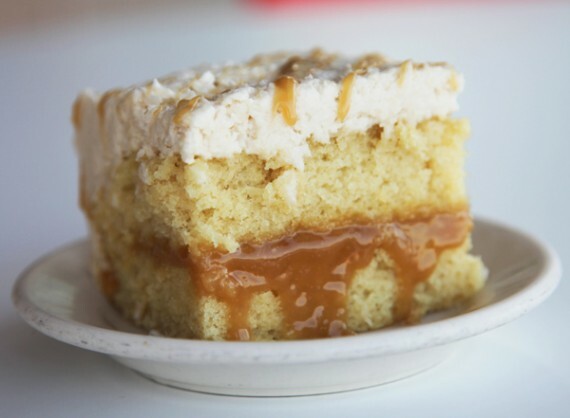 after some extensive googling, i found a reference to the elusive dessert on nite moon cafe’s facebook page. 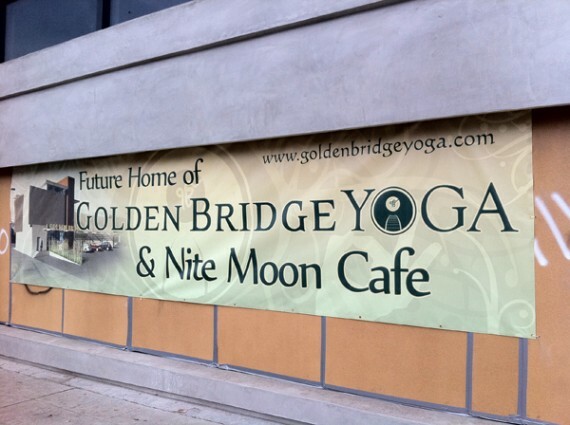 nite moon cafe is moving to de longpre and highland! i was out and about in hollywood yesterday, and i noticed this banner on a building near the corner of de longpre and highland. apparently the vegetarian restaurant nite moon cafe, and the yoga studio that comes along with it, are moving down the street from their de longpre/vine location to highland avenue. bummer that they won’t be so close to the arclight anymore, but at least they won’t be too far away. if you haven’t eaten at nite moon yet, get over there! it’s really good. check out our past review! 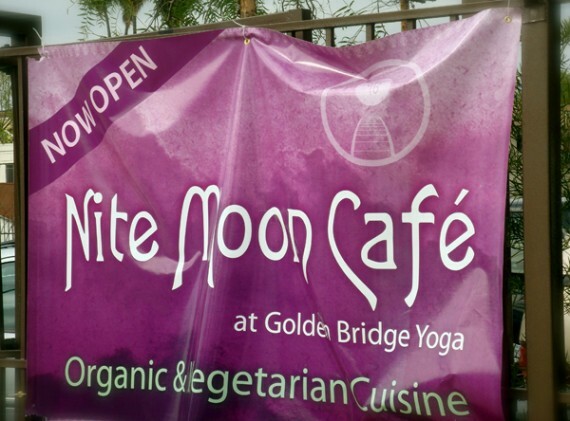 nite moon cafe is a 100% vegetarian, organic and vegan-friendly cafe located in the golden bridge yoga center in the heart of hollywood. 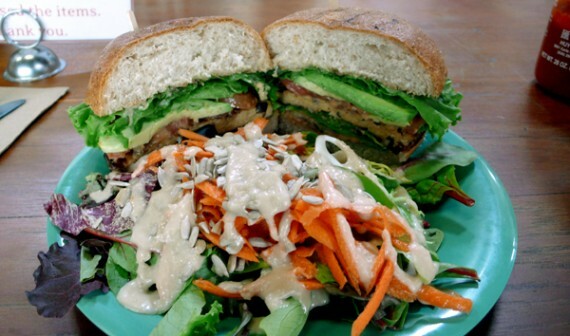 the menu is light and nutritious, a health-conscious vegan’s dream, consisting of sandwiches, wraps, tempeh burgers, soups and a large build-you-own salad bar. oh oh oh, and plenty of vegan desserts and smoothies! i checked out nite moon the other day with a friend, and we were both blown away by the quality of the food and the pleasant and relaxing dining atmosphere. i ordered the bridge burger, which i assumed would be pretty basic, and was extremely impressed with its originality and tasty-ness. 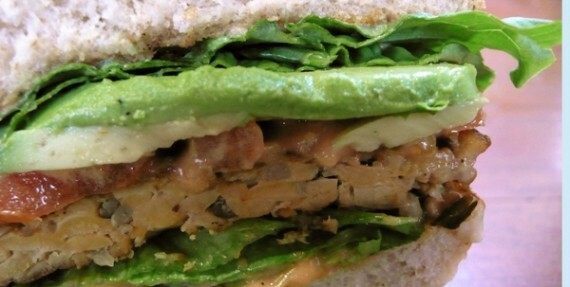 the tempeh patty was out of this world—chewy, tasty and firm all at once. the vegetables were fresh and organic, and the vegan thousand island was way better than the real thing. plus, nite moon really took it up a notch with the side salad…it was piled high with vegetables and seeds, covered in a delicious vegan dressing. everything tasted really superb. my friend went with the club sandwich, which i tried, and it was excellent as well. 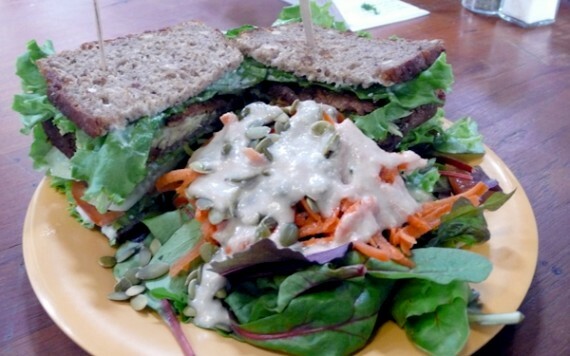 three thick slices of chewy rye bread stacked with first-rate vegetables and luscious tempeh bacon. mmm. needless to say, we both ate EVERYTHING on our plates…the food was so freaking good. what’s awesome though, is that we didn’t feel full or bloated. even after a large meal, we practically floated out of the place. i seriously can’t wait to go back—there are so many things on the menu i want to try, especially the vegan desserts and the huge, appetizing salad bar. 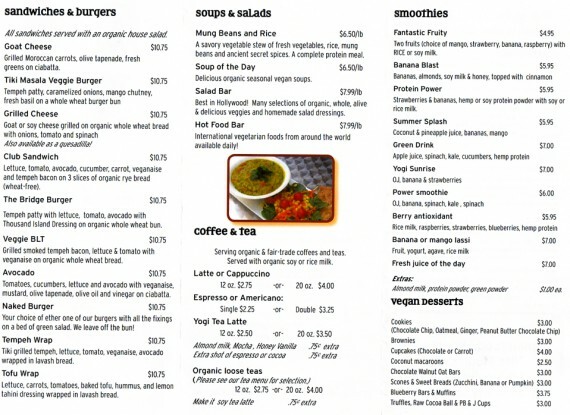 have a look at the menu…doesn’t it all look incredible? i must admit, even though i work in hollywood about 5 minutes from nite moon, i was hesitant to try it out. being located inside a yoga center, it seemed kinda intimidating. i imagined it would be like eating in a gym cafe, with lots of athletic types milling about in between yoga classes—i couldn’t have been more wrong! nite moon is located in what golden bridge yoga dubs a “spiritual village,” a tranquil and colorful area decorated with tibetan prayer flags. 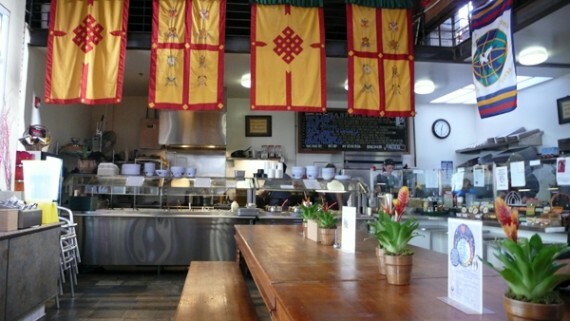 you order your food at the counter and find a seat at the long, wooden communal table while you wait for the friendly staff to serve you your meal. to the right of the cafe, there’s a huge commerce area with books, magazines, yoga supplies and clothing. the clientele is mixed, new age types, pregnant ladies, kids, young and old adults. it really is a beautiful, peaceful and welcoming place to enjoy a fabulous lunch. nite moon is located right behind the arclight cinemas at vine and de longpre, and they validate parking for the structure ($2/2 hours). head over and check it out as soon as you have a chance; i know i shall be lunching there very often.